Ba. Nanas. 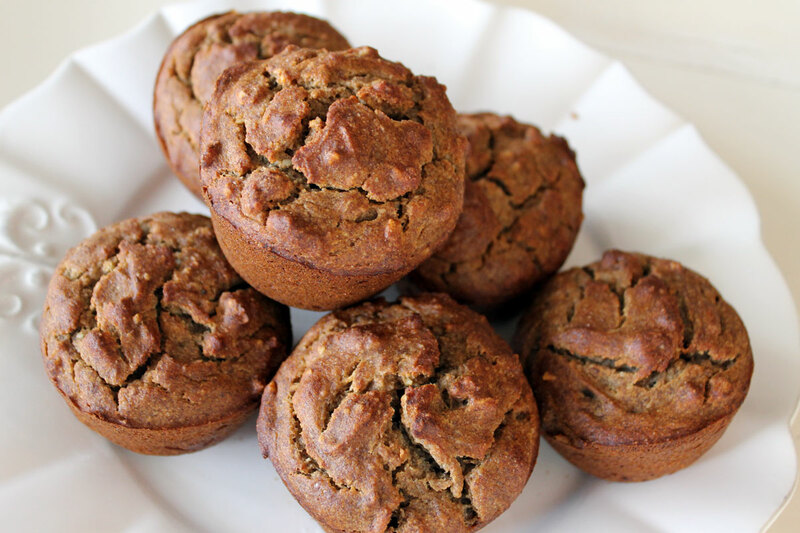 That’s all I can say about these unbelievably, crazy, so-delicious-you’ll-go-bananas banana nut muffins. That, and literally, they really are just bananas. It’s pretty easy to make healthy baked goods when the star ingredient is naturally sweet all on it’s own. Plus, all the moisture from the bananas lets you get away with a heck of a lot less fat and zero sugar in this recipe. That’s right, these guys are 100% sugar-free. There’s not an once/bit/speck of sugar in here. Zilch. Zero. Nada. The trouble with most baked goods is the combo of sugar (the refined white stuff) and flour (the other refined white stuff) and unhealthy fat. Traditional white flour and sugar has been processed to remove the fiber and virtually all of the nutrition right along with it, leaving not much other than sugar and starch (which to the body might as well be sugar). Whole grain flours (and whole sweeteners too) still have their fiber and nutrition in tact, which helps to slow the absorption of sugar/starch in the blood stream. That, plus the added fiber from the bananas, keeps you from feeling those sugar highs and lows. You get a steadier energy and can finally exit the sugar roller coaster ride. Once the batter is whipped up, I add chopped walnuts and also dates, which give some extra whole-food, natural sweetness. These little treats are my new favorite breakfast, snack, bread and dessert. Wholesome. Sugar-free. Dairy-free. Gluten-free. Sweet. Dense. And soul-warmingly delicious. Ba. Nanas. Preheat oven to 350F. In a food processor or blender, combine the almond milk, coconut oil, vanilla and bananas. Blend until smooth. Put the dry ingredients in a large bowl and whisk to combine. 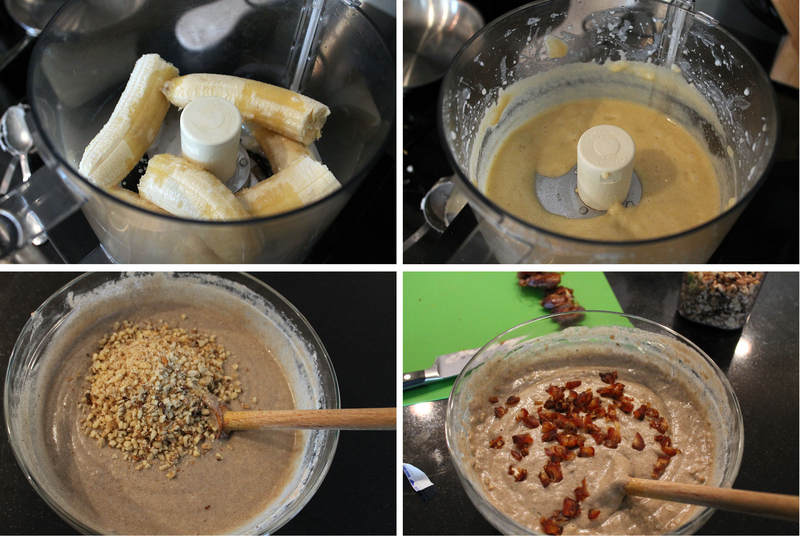 Pour in the banana mixture and stir until evenly mixed. Fold in the nuts and dates. Pour the batter into a greased or lined 12-muffin pan. Bake at 350F for 45 minutes to 1 hour. Previous postHealthy? Super Bowl? Oh ya. Hey Megg Just made these! Excited to see how they come out.One hour is a long time for these muffins is there a reason why? Megg, I was wondering if the coconut oil needs to be liquid (ie heated) before it goes into the food processor? Whenever I try to bake with coconut oil, I run into this problem! Hi Sam, on this one you can do it either way. I actually didn’t heat the coconut oil in this recipe because the food processor mixes it up pretty well with the bananas. If I were mixing by hand though, I’d melt it first. Hope that helps! Hey megan one more question for you…how many cups of flour is 250 grams? i used to cups last time and the muffins came out pretty heavy is this right? Hey! It’s about 2 cups… I know, these muffins do turn out quite dense…hence the long cook time. I think maybe because of the bananas?